Gorgeous 2013, two bedroom, two bath Palm Harbor Home being over 1300 square feet in size! Many upgrades have been made to the home from the interior to the exterior! Interior: The home has a feeling of glamour with the dark laminate and ceramic tile flooring, tastefully painted drywall, vaulted ceiling, exquisite lighting, tile backsplash, new stainless steel appliances in 2017, new sink and faucet, attractive kitchen island, inside laundry room with front loaders new in 2017, ceramic tiled walk-in shower, double vanity in master bath, two inch faux wood blinds accent the windows, ceiling fans and more! Exterior: Amazing curb appeal! 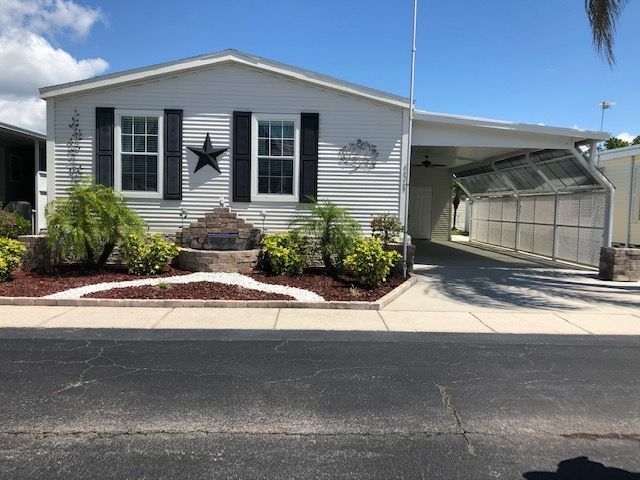 Water fountain with built-in lighting, decorative pavers, vinyl siding, shingle roof, extended carport with golf cart pad, 12x12 raised Florida room added in 2014, sprinkler system and central A/C unit in 2013. Community: This charming senior community has wide tree lined streets, many activities and amenities such as tennis, pool, exercise room, bocce ball, shuffleboard and more! Lots to do or just relax. A monthly fee of approx. $700 will cover water, sewer, lawn and garbage. Each month may vary due to the water and sewer fees. Two small pets are welcome in the park.